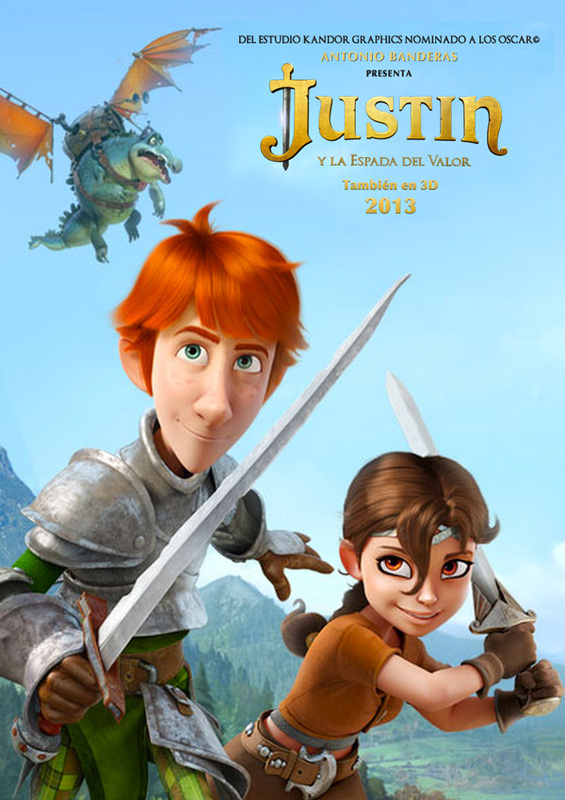 Poster teaser de Justin and the Knights of Valour ! Voici le premier poster teaser espagnol du futur long-métrage d'animation en 3D stéréoscopique "Justin and the Knights of Valour", réalisé par le cinéaste Manuel Sicilia et produit par Antonio Banderas, le studio espagnol Kandor Graphics et Kerry Furton. » Fiche de "Justin and the Knights of Valour"
» Plus d'informations sur le studio "Kandor Graphics"
Nouveau trailer : Justin and the Knights of Valour ! The http://www.michaelkorsoutletwebsite.us.com michael kors outlet thread on our PurseForum is filled with http://www.truereligionoutlet.us.com devotees of the brand's designs. Our followers showcase their love by revealing their latest handbag purchases or by toting around old http://www.coachoutletstoresonline.us.com Coach Factory Outlet favorites http://www.coachoutletonline.us Coach Outlet Online US http://www.michaelkorsonlineoutlets.us.com like the Bay Bag or Silverado. Whether you http://www.oakleysunglassess.in.net prefer old http://www.coachfactory-outletonline.com Coach USA Store or http://www.michaelkorsoutlet-online.us.com new michael kors, one thing's for sure: our Coach Outlet - http://www.coachfactoryonlineoutlets.us.com Purseforum members favor them all! Get ready for a trip down memory lane in this latest PurseForum roundup, and check out all our favorites from the Your Coach in Action http://www.coach-factoryonline.us.com thread! The Peekaboo debuted in 2009, and at first, it did http://www.christianlouboutinco.us.com what freshly debuted designer bags http://www.michaelkors-outlet-online.com normally do: the Peekaboo enjoyed a couple years of popularity and then got rotated to the back of the lineup in favor of whatever Next Big Things the brand had in the pipeline. http://www.factorystoreonline.com Generally, that’s followed by a bag http://www.coachonlinestoreoutlet.us.com being mostly ignored and http://www.coachoutletusaonline.us.com then eventually put out to pasture quietly, when people are unlikely to notice its eventually absence. Instead of that slow http://www.oakleyoutletsunglasses.com march into the sunset, Fendi decided http://www.coachoutlets.us to http://www.coach-factorystore.us.com reintroduce the Peekaboo and shoppers ate it up. It’s not unheard http://www.sacnoirpascher.com of for brands to try http://www.coachfactoryoutlet-stores.us.com and re-promote a bag http://www.chiflatironwebsite.us.com CHI Flat Iron that was once very popular, but it rarely works. Shoppers want novelty, and most bags that are eligible for re-promotion just don’t have the enduring appeal http://www.coachfactoryonline.name necessary to feel fresh instead of dated when a customer Coach Outlet USA http://www.coachoutletstores.us Coach Outle sees them again, http://www.raybansunglassesstores.us.com five years down http://www.outletonlineclearance.com the road. The Peekaboo http://www.coach-factoryoutletstores.us.com has already passed that test http://www.valentinooutlets.us.com with flying http://www.coach-factoryoutletstore.us.com colors, and there’s not reason to think it won’t http://www.coachfactoryoutletinc.us.com stick around for a long time. Also worth noting is the http://www.oakleyonlineoutlet.us.com Peekaboo’s positioning http://www.coachoutletstorefactory.us.com within Fendi’s lineup; the http://www.raybanonline.us.com bag is the brand’s most expensive, on average, and bags that become enduring classics usually hold that spot in http://www.raybanoutletonline.co.uk their designers’ collections. After all, if a design is destined for greatness, it should at least be the best in its class. For instance, the one http://www.oakleysunglassesshop.us.com you see above can be yours for $3,550 via Net-a-Porter. Celebs are all http://www.uggoutletonline.us.com uggs outlet over the http://www.ray-banoutletstore.us.com globe this http://www.oakleyonlinestore.us.com week, http://www.valentinoshoes.us.com and yet their http://www.raybansunglasscheap.us.com bag choices are oddly in sync. Bags from Fendi and Saint Laurent are http://www.michealkorsoutlet.us.com obvious faves, and a hot new style from http://www.classicbootshut.com ugg boots hut has just http://www.michaelkors-outletonline.us.org made one of its first appearances on the site and you're sure to have an http://www.valentinooutlet.us.org opinion http://www.raybansunglassesshop.us.com about it http://www.us-oakleysunglasses.us.com one way or another. In related news, Reese Witherspoon remains surprisingly loyal to her http://www.oakleyoutletsonline.us.com favorite http://www.valentinorockstud.us.com Salvatore Ferragamo style, and Solange http://www.truereligionjeans.us.org Knowles brought a mystery bag to Beyoncé's b-day party. http://www.oakleyvaultsunglasses.us.com If you can properly identify http://www.louisvuittonlv.us.com it for us, we will crown you as our leader. Beyond that, http://www.michaelkorsfactoryoutletonline.us.com most of the http://www.valentinoshoes.us.org episode was spent in preparation to go to Glamis. Much http://www.raybansunglassoutlet.us.com ado was http://www.raybanoutletsunglass.us.com made about Heather’s fancy http://www.hermesbirkinoutlet.us.com camper that she needed because she’s a princess http://www.ralphlauren-outlet.us.com who just can’t spend a night in a regular RV like http://www.clshoesoutletonline.com Tamra http://www.giuseppezanotti.us.com and her plebe http://www.raybansoutletonline.us.com family, as well as http://www.michaelkorshandbagsoutlets.us.com the foil packets her private chef http://www.ray-banoutletonline.us.com prepared for her so http://www.sunglasseshut.com.co she could just toss them on the grill without having to operate a http://www.polosralphlauren.us.com salt shaker or cut a vegetable. The results of http://www.wwwraybansunglasses.us.com Heather’s expenses and http://www.abercrombieoutletonline.us.com efforts http://www.raybanoutlets.co.uk were an RV that did not look especially more spacious or comfortable than the others on the inside, but was far shinier on the outside, as well as a meal that tasted http://www.christian-louboutinshoes.us.com probably http://www.valentinoshoesoutlet.us.com about the same as everybody else’s because http://www.michaelkorswallet.us.com Heather doesn’t know how to http://www.pascherportefeuille.com use a grill. http://www.truereligionoutletonline.in.net Heather also seemed to http://www.true-religions.us.com recognize that her http://www.michaelkorsfactoryoutlets.us.com special, expensive RV wasn’t stunting quite as hard on the others as she wold have preferred, though, but she didn’t http://www.oakleyoutlet.name explain why she http://www.valentinooutlet.org didn’t have http://www.valentino.com.co her http://www.oakleysunglassoutlet.us.com assistant find her an even better RV instead of just http://www.michaelkorsoutletonlines.us taking Tamra’s recommendation. Good help is so hard to find! Even in costars. After a long holiday http://www.valentinorockstudshoes.us.com weekend, it’s time to get http://www.oakleysunglassesdeals.us.com back to the swing of things, http://www.michael-korsoutletonline.com and what better way to http://www.michaelkorsoutletsale.us.com ease the transition than with a roundup http://www.sacblanc.com of http://www.louboutinshoes.us.com dreamy http://www.michaelkorsoutletco.us.com http://www.truereligionoutletco.us.com Coach bags? You all know I’m a big fan of Coach, but I’m not the only one who shares a deep and http://www.marcjacobsoutlet.us.org abiding love for the http://www.modeldesac.com brand. In our weekly http://www.achetersacamain.com celebrity style http://www.tomsshoe.us.com roundups, we always see celebs toting various Coach bags, and it’s hard not to swoon over the brand’s light structured, minimalist designs. But celebs aren’t the only loyal Coach fans; http://www.valentinoshoes.com.co plenty of our Instagram followers showcase their love for the bags on a http://www.north-faceoutlet.us.com daily basis, and we’re here to share some of our favorites from recent days. Finding http://www.acheterportefeuille.com Coach bags on Instagram is easy thanks to http://www.sacamainvuitton.com several dedicated hashtags http://www.sacamainblanc.com many avid Coach followers use, such as: #celine, #celineaddict, #celinebag, #celineparis–you get the idea. While Coach’s signature bags under Phoebe Philo may be the Luggage and Trapeze bags, many of our followers love those signature styles right alongside many of the brand’s under-the-radar bags. Get ready to see lots of Classic Box Bags, Trapeze Bags and much more below. Buy the Coach of your dreams via Bluefly and Vestiaire Collective!